Larry Darnell Fitzgerald Jr., professionally known as Larry Fitzgerald, is an American born football player currently playing for National Football League (NFL)'s Arizona Cardinals as a wide receiver alongside teammates David Johnson, Patrick Peterson, Chase Edmonds, and many others. 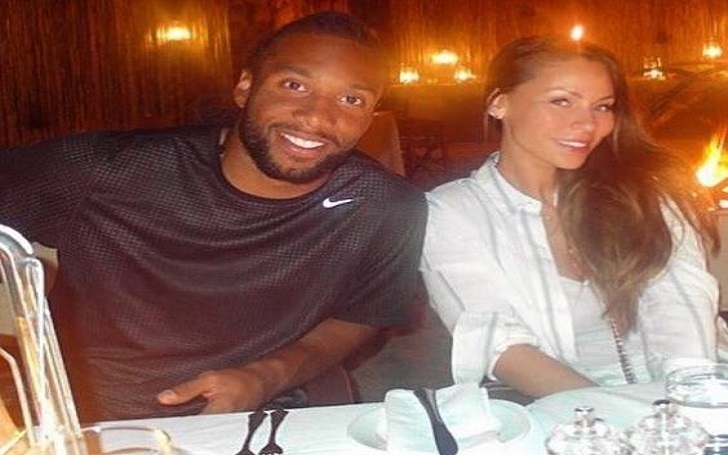 Larry Fitzgerald is currently dating his girlfriend Melissa Blakesley. As of 2018, his base salary is reported to be $11 million and makes $17 million annually in total. Fitzgerald has an estimated net worth of $97 million. Larry Fitzgerald is not married yet and does not have a wife but he has been in quite a few relationships in the past. His first ever public relationship was with Angela Nazario who is a former Oakland Raiders cheerleader. The duo started dating in 2006 while Fitzgerald was just 22 and Angela was 35. Nonetheless, they welcomed their first child into the world named Devine Fitzgerald and despite their age difference, their relationship was heading forward very smoothly. But in 2008, Angela accused him of domestic violence and filed for an order of protection against him. Fitzgerald soon started dating Melissa Blakesley whom he is in a relationship to date. The duo has been dating for quite some time now and they also have a child together named Apollo Fitzgerald. Even though they are not married yet, fans call Melissa his wife as they have been together for such a long time and also have a child together. Fitzgerald has not made his Super Bowl in a decade. However, he was featured in the NFL 100 commercial that was played at halftime of the game between the New England Patriots and Los Angeles Rams. He was seen on the commercial after Hall of Fame quarterback Terry Bradshaw threw a pass among 5 receivers including Fitzgerald. Larry Fitzgerald has an estimated net worth of $97 million and as of 2018, he is receiving a base salary of $11 million followed by an incentive bonus of $1 million. He is also the fourth highest paid players in NFL with an annual earning of $36.8 million but was dropped off the World's Highest-paid athletes in 2015. No better way to celebrate #FathersDay than by hitting the road with my kids in matching Slingshots! Thanks @PolarisSlingshot! In 2007, he signed a four years contract extension worth $40 million with the Arizona Cardinals while in 2011 he signed a contract worth $120 million with the team. Likewise, in 2015, he signed a new multi-year contract with the Cardinals which promised him at least $11 million in the next two seasons. In 2016, he signed another one-year extension contract with the team which was worth $11 million. His salary for the 2019 season is reported to be $11,000,000. Other than his on-field salary, Larry Fitzgerald is also known to endorse big brands like Nike, Lenovo, Nokia, The University of Phoenix and many others. His earnings from the endorsement deals are reported to be $1.5 million a year. He can also be seen promoting Bose Headphones on Instagram. Making millions of dollars just through endorsement deals, these brands have a big hand in Larry Fitzgerald's current multi-million dollars net worth. Larry Fitzgerald owned a house in Paradise Valley which he listed for sale for $5 million in 2018. He sold the house in February 2019 for the marked price. He reportedly has other houses but hasn't revealed yet. He has several cars in his collection but prefers to ride his custom 1968 Dodge Charger R/T. Thanks to Penske Auto Mall for hooking me up with my ride to #FitzsSupperClub tonight!! Besides, Dodge Charger R/T, he also owns BMW 7-Series, Range Rover, 68 Shelby Mustang, Rolls Royce etc. Larry Fitzgerald was born on 31st August 1983 in Minneapolis, Minnesota. He is the son of Larry Fitzgerald Sr. and Carol Fitzgerald. His father is a sportswriter at Minnesota Spokesman-Records while his mother died in 2003 because of a brain hemorrhage while getting treatment for breast cancer. Likewise, he also has a younger brother named Marcus Fitzgerald who is also a football player. Fitzgerald started playing football during his high school days at Richfield (MN) Academy of Holy Angels. Later, he started playing for the Pittsburgh Panthers football team after attending the University of Pittsburgh. During his college years from 2002 to 2003, he was named one of the best wide receivers. Meanwhile, Fitzgerald is the ninth player in the history of Pittsburgh Panthers football team to receive the honor of having his #1 jersey retired by the university. In 2004, Larry Fitzgerald petitioned the NFL to allow him the 2004 NFL Draft as he has left his high school during his senior year to attend Valley Forge Military Academy. Later, NFL allowed him to enter The Draft claiming him to be eligible. In the year, he was drafted by the Arizona Cardinals as the former coach of the team, Dennis Green knew him for his days as Vikings ball boy. Moreover, in the year's draft, he was also the first wide receiver to be selected. He soon made his NFL debut in the opener season of 2004 against St. Louis Rams. His team lost by 17-10 but in the game, he has four receptions for 70 yards. Likewise, by the end of his first season in NFL, he had eight touchdowns and 59 receptions for 780 yards, as his team missed the playoffs in the year. During Fitzgerald's second season as a professional, he has one touchdown, 13 receptions for 155 yards during Cardinals' game against the New York Giants. Likewise, by the end of the season, he has 10 touchdowns, `103-receptions, 1,409-yards which resulted in him being named the Pro Bowl. As of 2018, he has already played 14 seasons with the Arizona Cardinals and below we have also listed down his latest NFL career statistics. Likewise, throughout his 14 years as a professional NFL player, he has won numerous awards and honors. In 2009, he earned the MVP honors, followed by NFC Offensive Player of the Week honor in 2011 and 2012 respectively.